This article was originally published in the fall 2014 Harker Quarterly. 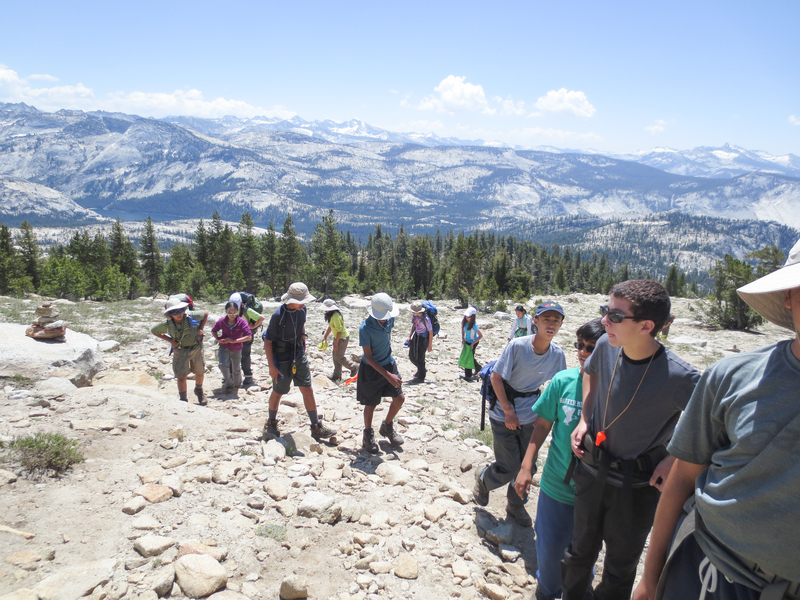 In mid-June, 19 students and three teachers set off on a five-day backpacking adventure in Yosemite National Park, packing in their own supplies and making their own food. Science teachers Ben Morgensen and Daniel Sommer, and math teacher Margaret Huntley, accompanied students on the trip, which began at Crane Flat Campground. After Crane Flat, the group drove to the May Lake Trailhead. “On the way … we watched the land unfold in front of us, with towering peaks jutting sharply into the deep blue sky and babbling brooks merrily cascading down deep gorges,” reminisced Andy Semenza, grade 9. Once at the trailhead, it was a short hike up to May Lake through the alpine landscape. Upon their arrival at the lake beneath Mt. Hoffmann, they proceeded to set up camp and cook dinner. The next morning, the students climbed Mt. Hoffman then descended to Murphy Creek where many of them fished for trout in the lake. That night, some of the group opted to spend the night in sleeping bags on the granite. “Throughout that week, we learned many lessons only possible outside the confines of the classroom walls – from the crippling effects of altitude to the feeding practices of ospreys. However, we also had to cope with more psychological issues, like managing a good pace for a group or dealing with tent mates,” said Semenza.